This is the second book written by Laura Frantz, it isn't a sequel to The Frontiersman's Daughter, but a couple of characters were mentioned. We are sent back in to the wilderness of Kentucke to follow Morrow Mary Little. She spends quite a bit of her life trying to get over the loss of her mother and baby sister, killed by the Shawnee Indians and of her brother who was taken hostage when she was five. At the age of sixteen, Morrow was sent to visit her aunt in Philadelphia, only to have the Revolutionary War break out in earnest shortly after she had arrived. She spends two years working in her aunts dress shop sewing for the British military and their ladies, but she is ready to go back to her home and to her father. When she returns, she is happy to get back to her old way of life, however she is disheartened to find her father isn't as healthy as he once was and is determined to help him as much as possible, even if that puts her in the mix with two Shawnee who have come to their door for many years, a chief and his son, Red Shirt. Morrow realizes that they aren't people that she has always thought and slowly her mind and heart work toward forgiveness. Morrow also comes to the realization that the Shawnee aren't the main cause of the problems surrounding their community, but her own people. 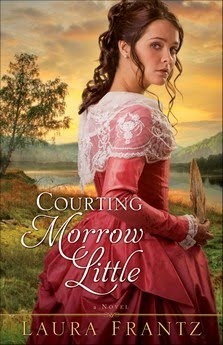 Courting Morrow Little was another beautifully written story by Laura Frantz. The detail to the story is just phenomenal. You can tell how much research has gone into the work. Each character brings something unique, whether frustrating and fascinating. I really liked following Morrow through her decisions. She is determined to live her life as best as can and protect the people she cares about. She does her best to put everyone elses needs ahead of hers. I also enjoyed reading about Red Shirt and the life he lived. I only wish the story was a little longer or there was a sequel to this one. Morrow and Red Shirts stories were interesting to follow.